So, I'm not trying beat a dead horse (hello, morbid euphemism) but, I'm so bummed about Google Reader (I'm convinced it's part of a grand scheme to get people to use Google+). I'm pretty type-A, so I had everything super organized into categories and I had a specific reading order and all that jazz. I think I'm going to try to switch to Feedly, as it seems to be similar. I think a lot of people are hoping their readers will switch to BlogLovin', as that could be a good way to keep track of followers, but I don't have a lot of followers so I'm not too worried about it. However, (psa! psa!) you are welcome to follow me via GFC (looks like it's going to be around for a while longer), Bloglovin, Facebook and (newly added!) Twitter. Are you switching to a new reader? Does anyone have any experience with Bloglovin' or Feedly? Do you have any other recommendations? I use Bloglovin....have been using it for awhile. Much easier than Google Reader anyway!! And it's kinda cool here in Austin today too. I have a sweater on...so much for the first day of Spring! Same thing - I have it, but I have yet to use it! Cute outfit! cute shoes and vest! I use Bloglovin to follow blogs and I like it alot! I am loving that vest and necklace combo! I am so new to Bloglovin but I like it so far! I know - I saw that you still had snow on the ground! Well, I wish we would have at least gotten one good snow :( I'm glad to hear good reviews for Bloglovin - I just need to give it a chance! 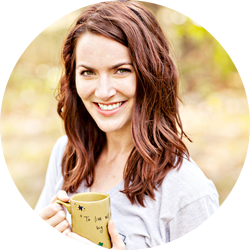 I just started using bloglovin and it's super easy. You outfit is so preppy and fun. I love that necklace. It's freezing here, so I don't think Indiana got the Spring Memo. 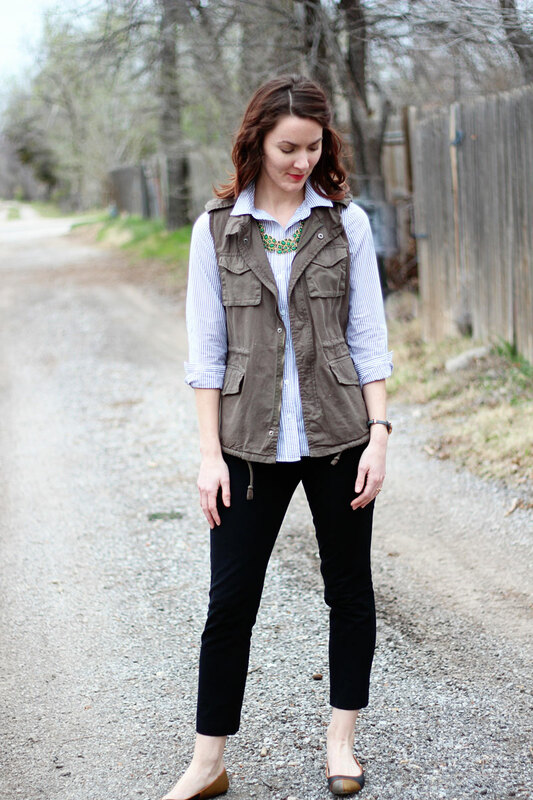 Love the light layers with the vest! The necklace is a great pop of color! As for the weather, we had temps below 20 degrees today, so I wont be pulling out my crops, ballet flats, or rolled sleeve for a while! So jealous you've been able to expose a few inches of skin! Below 20 - boo! You are definitely still in boots/tights weather... I hope spring comes soon! Love your outfit. 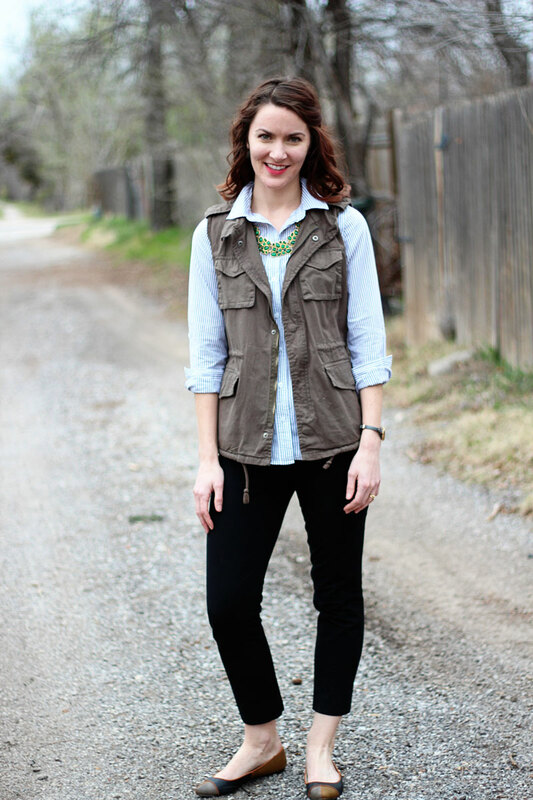 The vest is a fave piece of mine! Isn't it just so versatile?! I swear my vest goes with everything! "Pre-spring" - maybe we can make that a thing?! Haha, 562 posts?! That's what I'm afraid of! 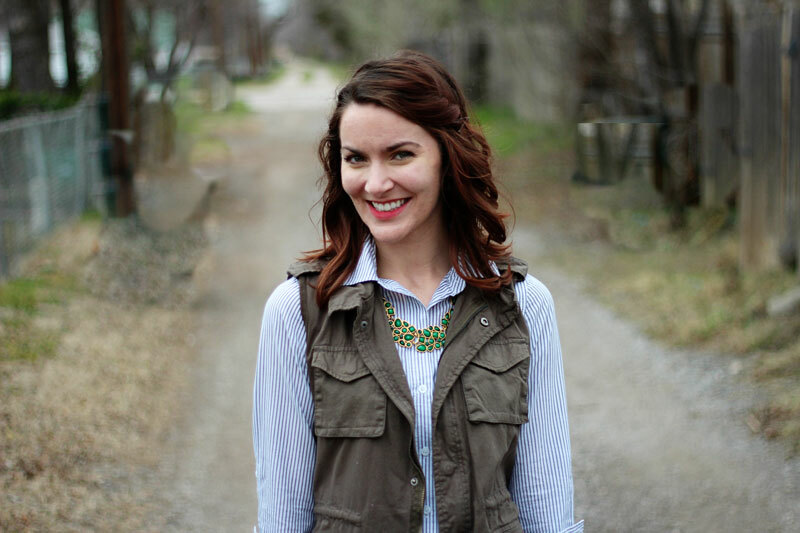 Thanks for taking the time to comment on my blog:) Your necklace is amazing! Thanks, Jessica! I'm so glad you stopped by! Great outfit, I love the vest and it looks great with the blue striped button down! I just signed up for Bloglovin's cuz it's what all the cool kids are doing. I'm pretty bummed about GR too, I'm going to keep using it for as long as possible. Grr... me too! I'm going to stick with Google Reader and try to make the switch this summer when I have more time to get everything organized. First, I love this outfit. I'm really wanting a vest like this lately. Second, I like bloglovin. And you're right, it is totally a plus to be able to track followers. Well, you are just the greatest! Thanks for letting me know. I just checked out the site and it looks they have a lot of great deals! I switched to bloglovin' a while ago and I love it. Took me a bit to get all my categories set up and my blog organized but I love it now! I don't really check to see how many followers I have but I love it as a reader. I love that it gives a preview of the post so I can decide if it is something I want to read right away or not. And, they have a great iPhone ap that I use when I'm traveling for work to kill down time. I think I need to actually take the time to sit down and get everything organized. I'll probably wait until June to make the switch, ha! Cute outfit! I have probably broken all of the rules and donned my sandals already. :) I'm just too excited about the warmer weather! I know!! Can we have some grill parties at your house this summer?! Love your vest and I really wish it were warm enough for sandals already!! Thanks! I just wish it was warmer already! That's exactly why I'm thinking of going with Feedly - I like everything to be in one place! 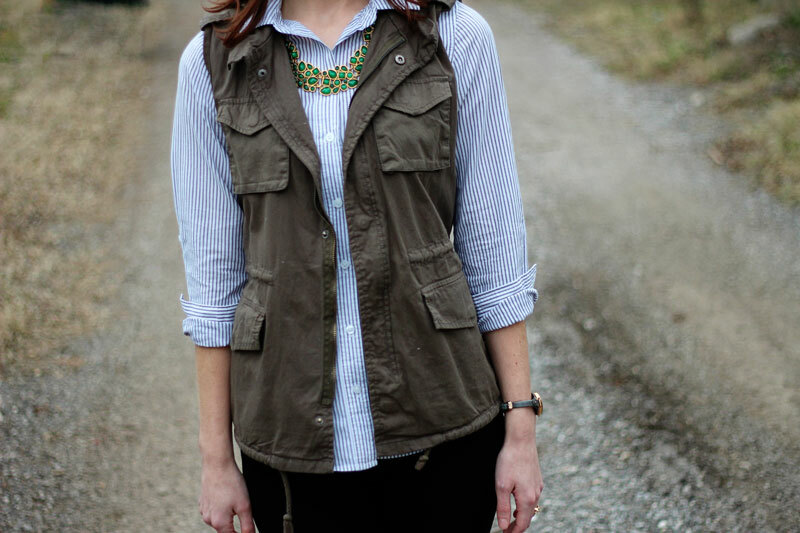 The button down looks so cute layered with the vest! I had been using Bloglovin for a while now since the feeds weren't updating properly with Google Reader for me. I need to make the switch! I have an account, I just need to focus on using it exclusively to give it a chance! Aw, thanks so much Meg! Exactly! That is my problem with Bloglovin too! Hey, at least they gave us a few months to figure out what we are going to do! Thanks for input Kelly! I think I just need to give it a chance! the necklace adds such a soft touch to this outfit. i never would have put it together, but it looks great!! Thanks Joni! It has definitely become one of my favorite necklaces! I've been using Bloglovin for awhile now and I like it. Love your outfit too! Great necklace! Ooh, love this outfit! The jeans, shirt, and jacket - they all go so well together! Pretty.